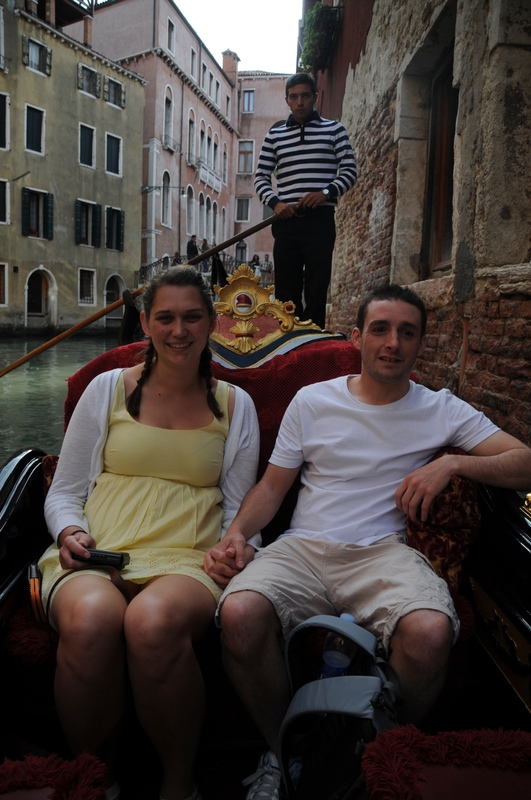 Hi Deb, here is a page full of photos of Sarah and Ben in Venice just for you. Imagine you’re here with us … enjoy!! 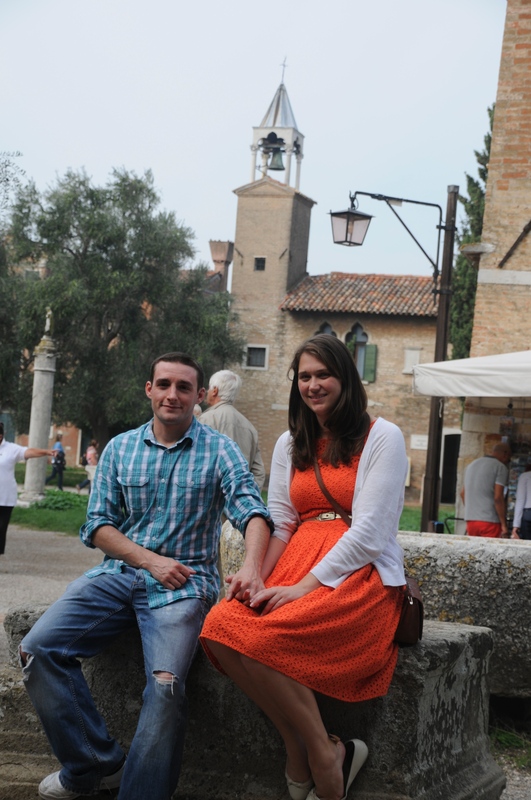 We had a relatively early start as I’d booked a tour or Murano, Burano and Torcello. Here we are, waiting for the vaporetto. at Torcello, with buildings dating from the 11th and 12th centuries. Sarah having to cover her knees because this is a modest island – no bare shoulders or knees. She didn’t think I’d catch her, but I was too quick! 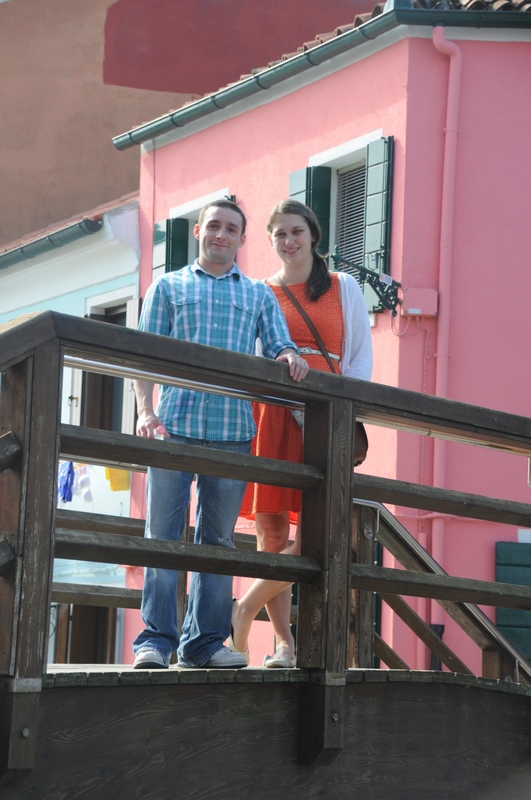 Another island … this one was our favourite … Burano. 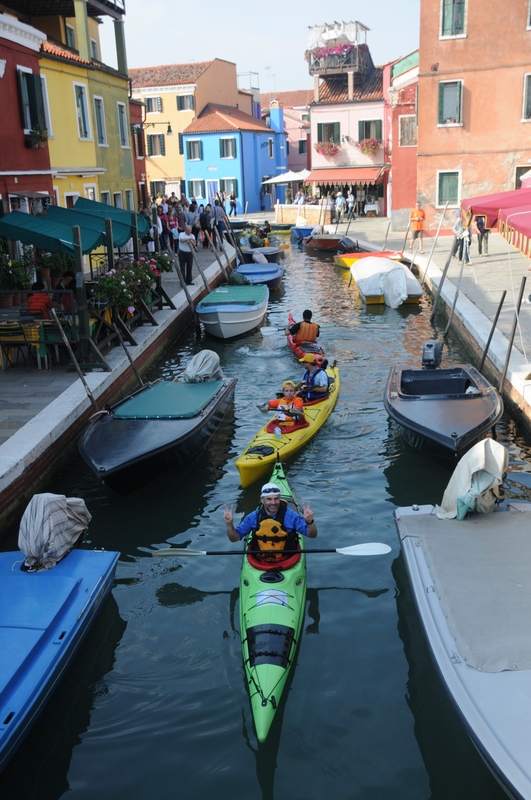 Kayaking in the canals of Burano … this man is having fun!! 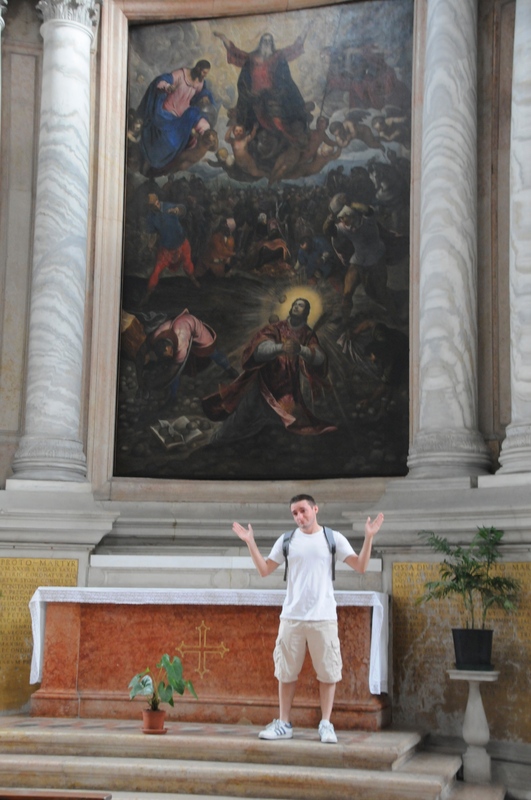 And finally, we ended up in Piazza San Marco. So there you have it Deb. 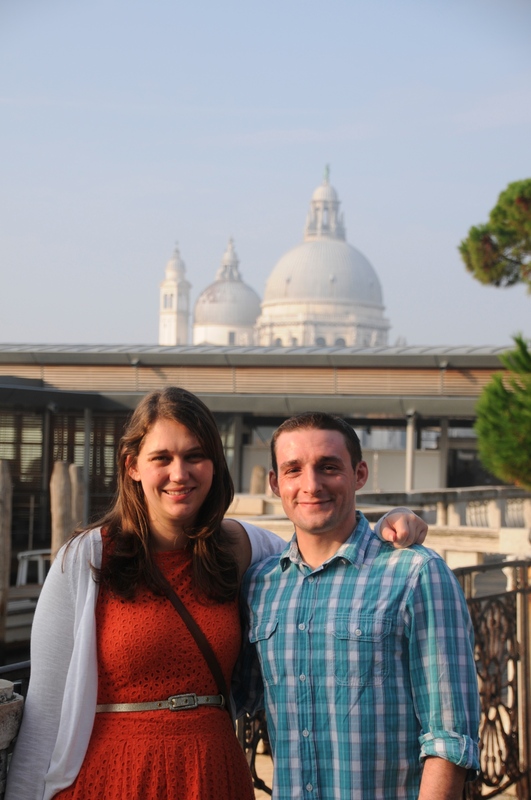 A chronicle of our first day together in Venice. Day two saw us move from Oceano Mare to ‘the apartment’ – almost next door. The front door of the apartment was quite battered and very old looking and we were a little worried, but inside it was lovely. Freshly renovated – and right on the edge of a canal (don’t ask me which one, street and canal names are not my strong points in Venice). Ben saw a gondola slide by the window, adding a touch of authenticity to the scene. 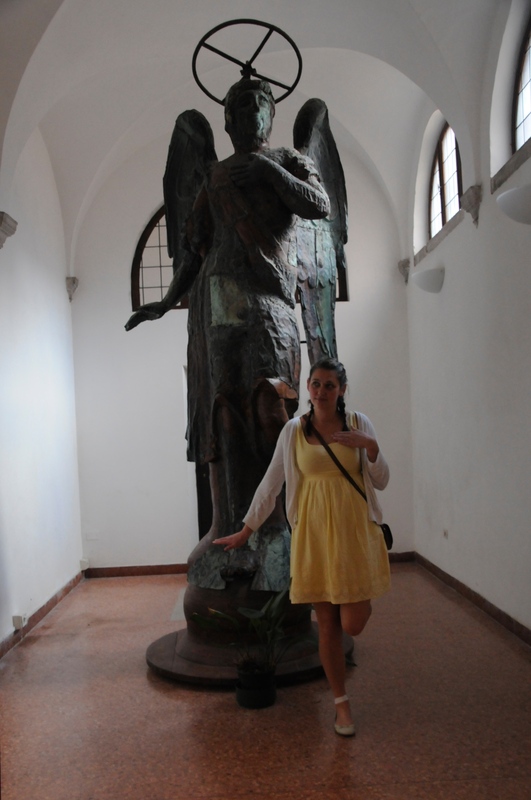 We started the day in church – and Sarah thought it would be appropriate, given it had been a little while since she had been in a church, to imitate an angel. Oh my gosh! I’m glad we weren’t up there on the hour! It was so loud Ben was looking for a way out in case it happened again. Despite the signs about modest dress Sarah insisted on showing off her knees again, and sought forgiveness in prayer. 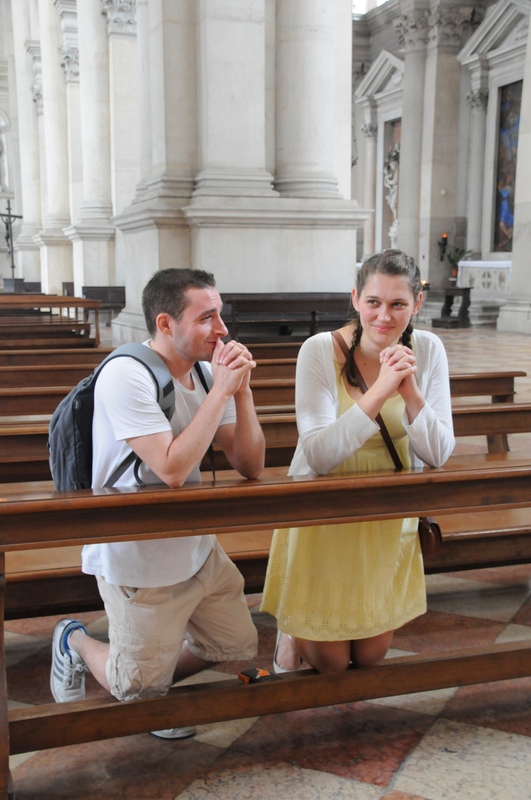 Being penitent on bare knees – for showing them! 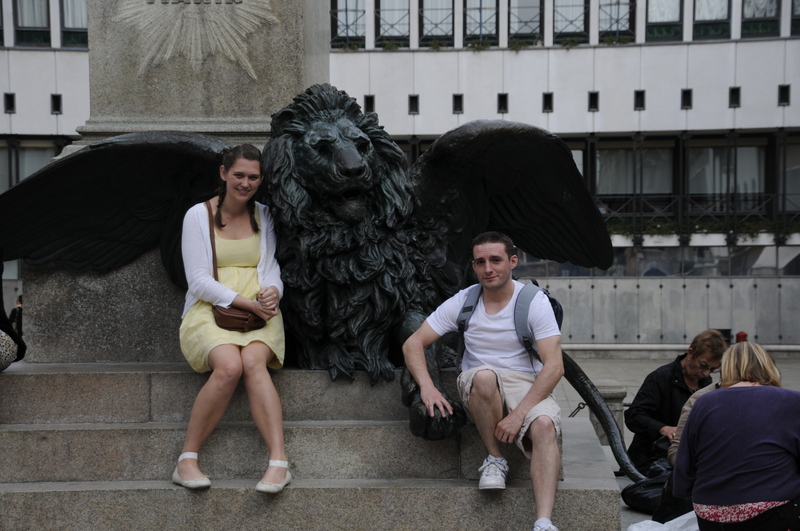 “Oh look”, said Sarah, “there’s a statue of Aslan” [the lion from the CS Lewis books]. Ben said that his paw-to-paw moment with the lion was particularly touching. We met up for a late lunch, and then we did some more walking. In fact we did a lot of walking. I’ll walk, but I won’t pose for photos of me walking. 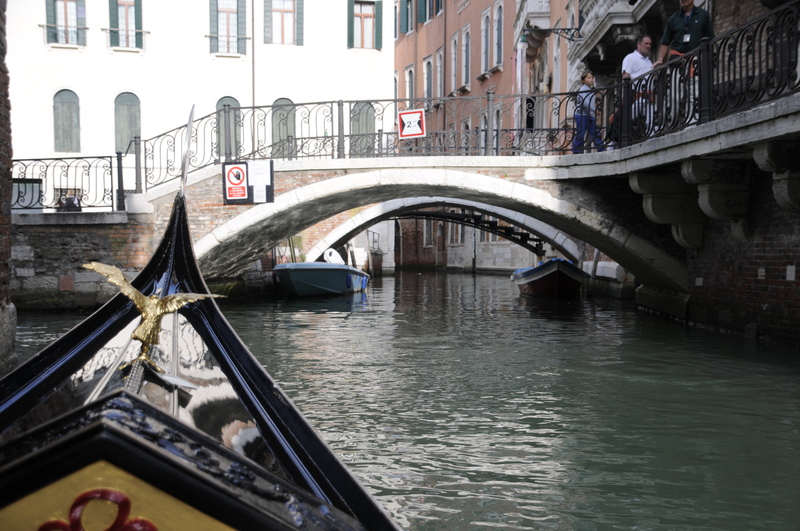 and agreed to take us for a little jaunt around (some of) the canals of Venice. It was amazingly peaceful on the canals. 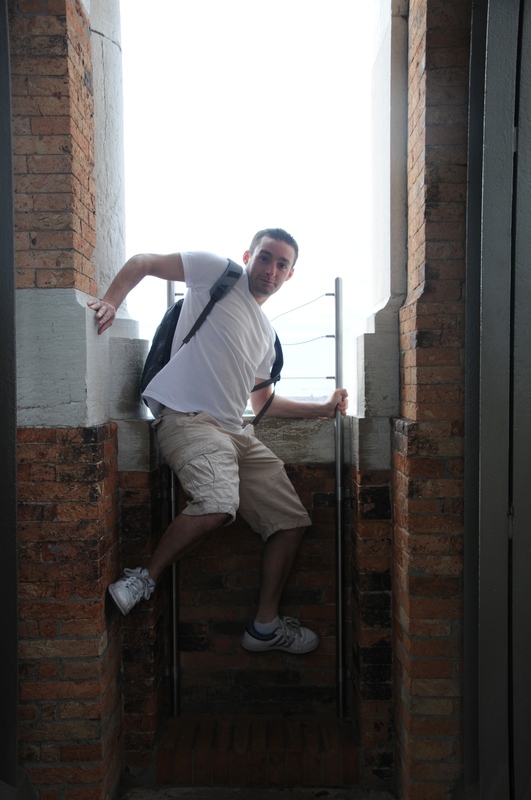 Then we got to the Grand Canal – that wasn’t as peaceful. At 6pm I began a journey to the laundromat. I took the maxim ‘get lost in Venice’ literally, and for the next hour and a half wandered in circles in an infinite maze of narrowness and increasing dark. 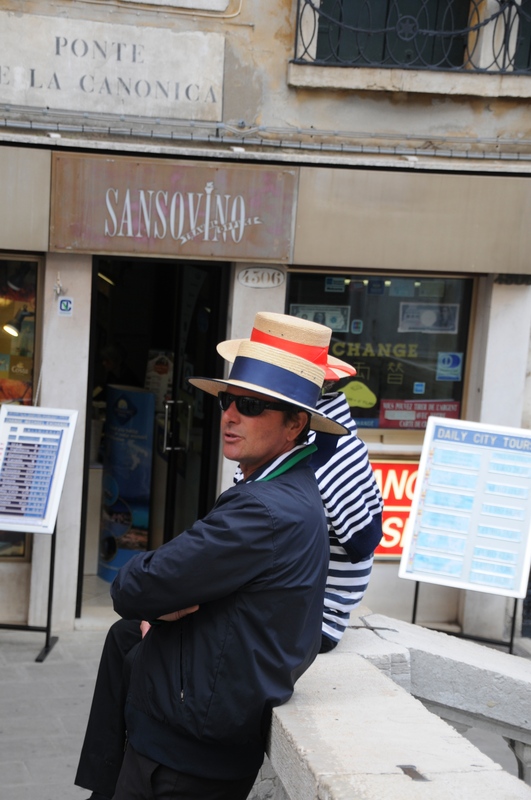 There are six ‘areas’ of Venice – I think I visited four of them, crossing from one side of the island to the other a number of times. It was not my finest hour and a half. 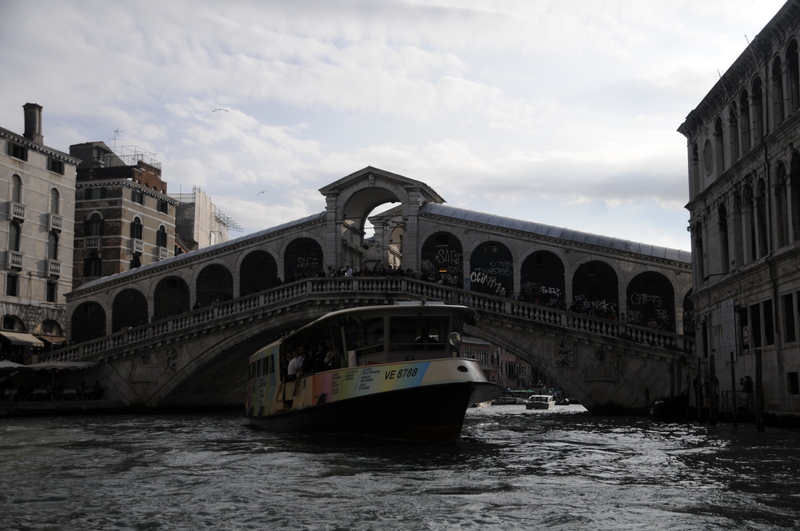 I finally found somewhere I recognised – the Rialto Bridge (it’s quite recognisable) – and from there found my way to Piazza San Marco, and from there to the meeting place we’d agreed upon at 6, when I’d started my journey. It took Ben six minutes to find what I’d spent 90 minutes searching for.